The end of the vegan month of food is upon us. What can I say? It’s been fun. I’ve made more food and been out to eat a little more than usual. I’ve been inspired by my fellow vegan bloggers to try new recipes. Tonight I made some black bean brownies – something so delicious that I would never have thought to try had I not stumbled upon it this month. I have been challenged. I am generally good at starting things but occasionally fail to see projects through to fruition. It has been good for me to have a project to focus on and see it through to the end (I am aware this last post is a day overdue but better late than never hey 😛 ). I have connected with a lot of amazing, kind and like minded people through the Vegan MoFo. I hope to continue these friendships and sharing of ideas as it warms my heart to know there are other vegan foodies like myself that get as excited about food as I do. All in all I have loved my Vegan MoFo. I shall definitely be doing it again next year as it’s been an experience. I have been a little more indulgent than usual however, so for now my focus is on simplicity. Simple nourishing organic foods that taste great and speak for themselves. 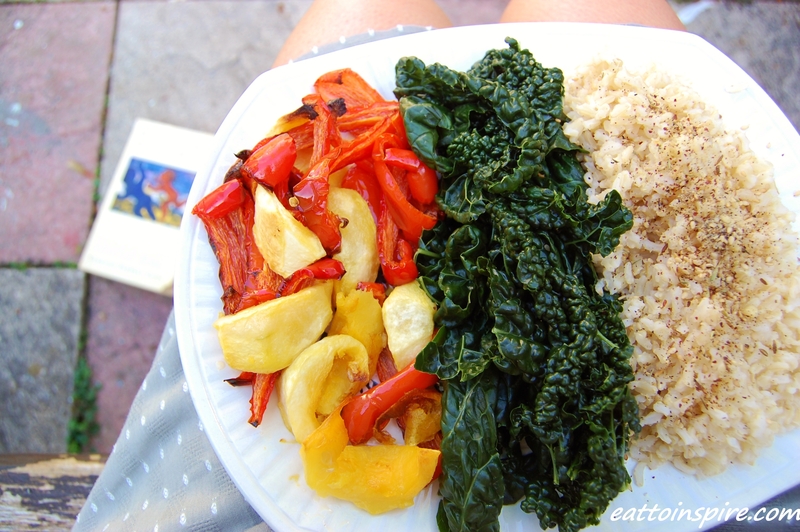 For lunch yesterday I had some sweet peppers and squash, cavelo nero kale and rice. Simple. Delicious. Nurturing. My aim for the next month shall be on eating clean, simple organic food. I am due to have surgery on my right shoulder on Tuesday morning, in order to fix an old injury. My body shall be undergoing a lot of healing work so I want to feed it the highest quality produce I can get my hands on in order to help it to heal. I shall not be able to run for three weeks (I’ve not run for the last week and a half as I have groin strain – ouch). This will be very challenging for me as running is my way of releasing stress, relaxing and unwinding. I am the first to admit I can be cranky and temperamental if I do not get sufficient exercise. I am a pretty simple person, I need food water and exercise to keep me happy, not unlike your family pet! I am going to stay with the folks for my recovery and I am very much looking forward to relaxing, being looked after and playing with the kitties. I have many unfinished books to take with me and a fresh pad of paper in need of paints. My new blog project for whilst I am home will be my self challenge to take a photograph of the sunrise every day which I shall put together at the end of my time at home. I am really looking forward to spending time with my parents and getting to know them as adults as opposed to parents. What are you going to do now that MoFo is over? What have you enjoyed most about Vegan MoFo?